It provides real-time breathing zone measurements of dust and aerosol. Small and Lightweight this unit clips fairly easily to a workers belt whilst the miniature sensor clips to the collar. There is a user adjustable alarm which can be set to warn of threshold limits. 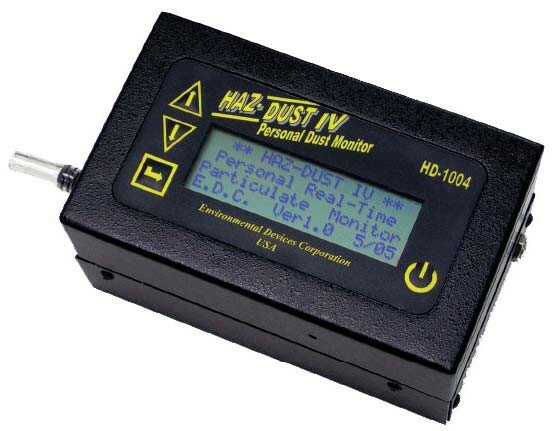 A simple 4 key operation and menu driven instructions displayed on an easy to read LCD display means the HAZ-DUST IV was designed to be easy to use. When using this unit it is as easy as selecting the desired particle type, connecting the appropriate sampling head and adding a filter behind the sensor. It’s ready to begin monitoring as soon as the unit is clipped to the worker and zeroed. Targeting a specific fraction can be done by selecting one of the HAZ-DUST IV heads to measure inhalable, thoracic or respirable. An in-line 37mm cassette behind the sensor can collect a concurrent filter sample for galvimetric or chemical analysis. You can then download the data from the HAZ-DUST IV to a PC for further analysis and preparation of management ready graphs and reports using the brilliant DustComm Pro software.